As some of you might know I do (apart from this blog) a lot of editorial work for magazines – mostly gardens, food and lifestyle – and that part of my job is something I really love doing. And even if I love the way I’ve used this blog as my personal creative space where I can grow and experiment creatively, I’ve been wanting for quite some time now to occasionally write about and publish other stuff than my own recipes. And the idea has dwelled in my head for a while now to do interviews with ceramicists whose work I love. 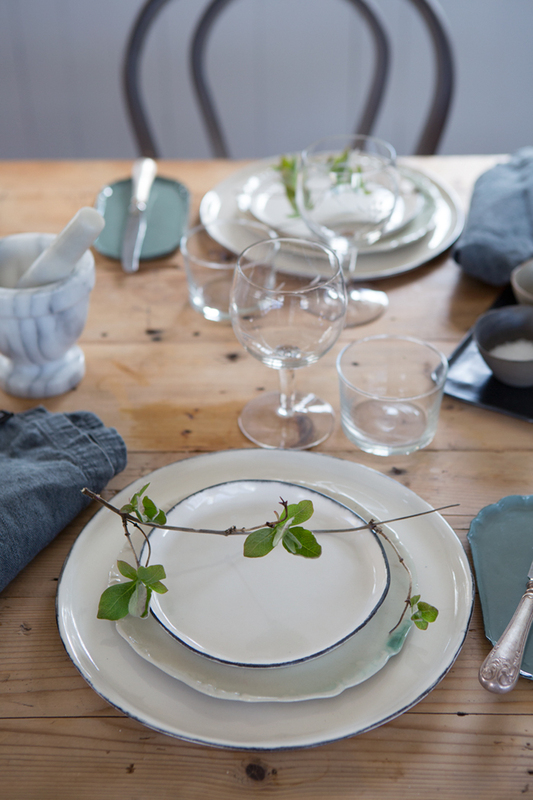 And what could be a better match for a food blog than tableware and ceramics? So I have decided to start a new series called ‘Creative Q&A’ where I’ll focus on ceramicists that make beautiful every day use objects. Objects that I admire and that you see in use often here on the blog. 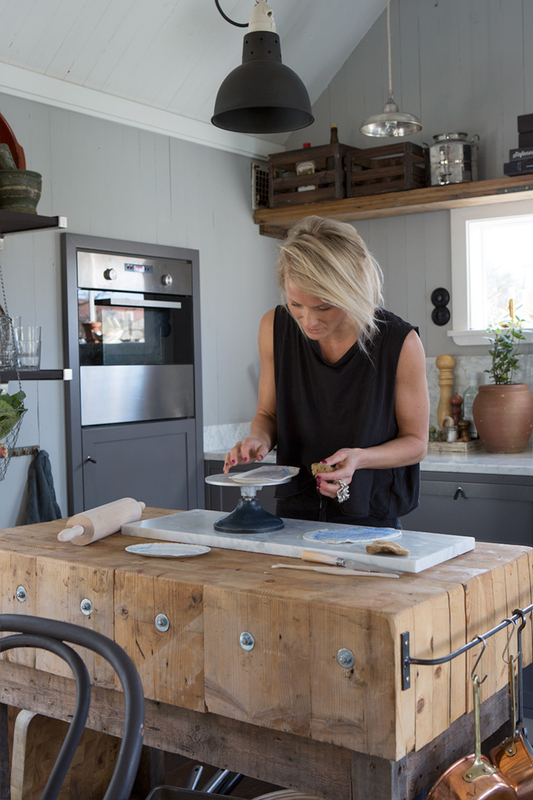 Today you’ll get to meet Elin Lannsjö – a wonderful person and ceramicist based out of Gothenburg on the west coast of Sweden. Elin creates unique, functional and awesomely beautiful objects for everyday use. 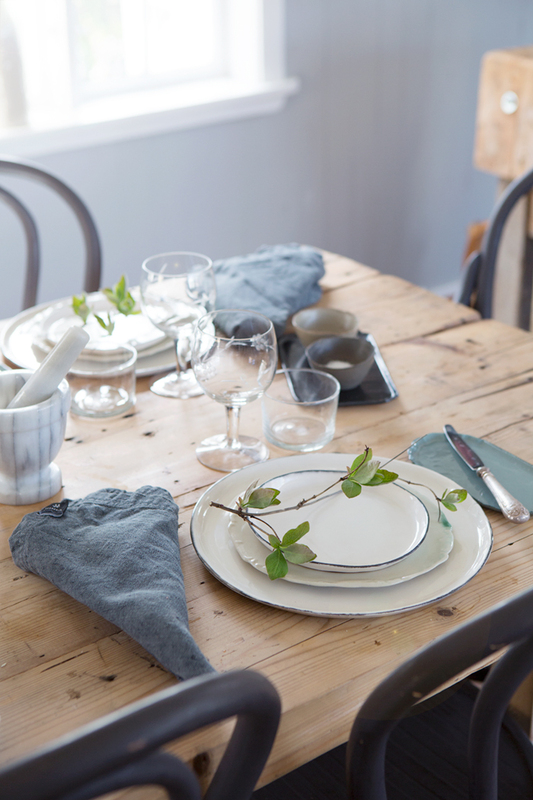 Each piece is made entirely by hand and topped with glazes in beautiful natural hues. All of the items are produced in small batch runs that will make daily life that much more beautiful. She says she doesn’t strive for ‘perfection’ in her work. She wants every piece to be unique and with irregularities so that you can see it has been made by human hand. 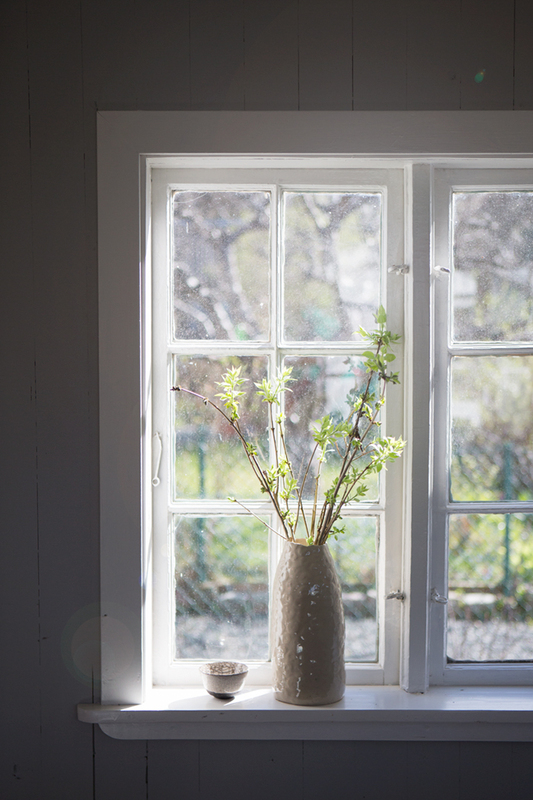 Elin was kind enough to answer a few questions – and to let me have a look inside her little cottage where she often comes alone to work or with her fiancé just to hang out. 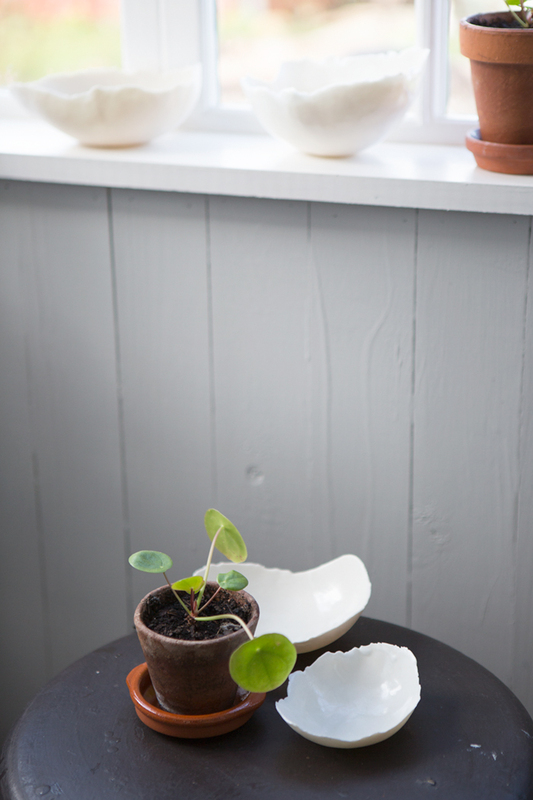 How long have you been making ceramics for? I’ve been doing it for six years now. What was it that made you realize ceramics was something you wanted to spend your days doing? I’ve always been interested in design which led me to study a few design oriented courses at university about eight years ago. At that time my focus was on textile design, and I experimented a lot with pattern design and so on. It was somewhere during that time that my passion for creative stuff was born. I became fascinated with the creative process of starting with an idea or a vision and then just ‘see what happens’. It was a little later that my interest for clay started. I took a course to learn the basic methods which gave me a good foundation to start experimenting on my own. Ever since, I have been ‘learning by doing’ and I’ve learned especially much from all the mistakes (she says and smiles)! It is also out of passion and curiosity for the craftsmanship that I’ve learned the most. Because when you learn out of curiosity and on your own terms you learn things suited to your own interests and needs. Is there anything in particular that inspires you in your creative process? I love to surround myself with natural elements and materials, and there are of course certain environments where I feel more at ease than others. Environments that trigger my creativity. But creativity is also such an ongoing and abstract process where sometimes you’re not really sure what it was that inspired you in the first place. When I look actively to be inspired though, I turn to fashion, interiors or beautiful photographs in magazines and on blogs. When I create a piece the process often starts with a shape or an idea that appeals to me and then I just go from there. I often also get inspired during the process of creating my pieces – an unexpected effect in the glaze, or when I during the process discover new qualities of the clay I’m working with that makes me want to try new things. Your dishes and platters are a perfect canvas for food presentation but also for display of other items in the home or to create beautiful stills around the house. Do you have a certain use in mind when you create a new piece? The aesthetics is always the most important for me no matter what piece I create. I want my pieces to be beautiful and appealing just to look at. But my vision is also that the pieces should be functional for the every day use of the owner. And last but not least, I also love the idea of when not ‘using’ an item it should be decorative just as it is. Perhaps as an eye-catcher on a windowsill or on a sideboard. Do you have a personal ‘darling piece’ among your work? I especially love my large ‘Giant’ urns. They are massive and they take weeks to make. The process of making them is also really interesting since the drying time is quite long and you can change its shape and form as you go. It is a very rewarding and inspiring way to work. And lastly – a giveaway! Elin has also been kind enough to share a small dish for a giveaway with one lucky reader. 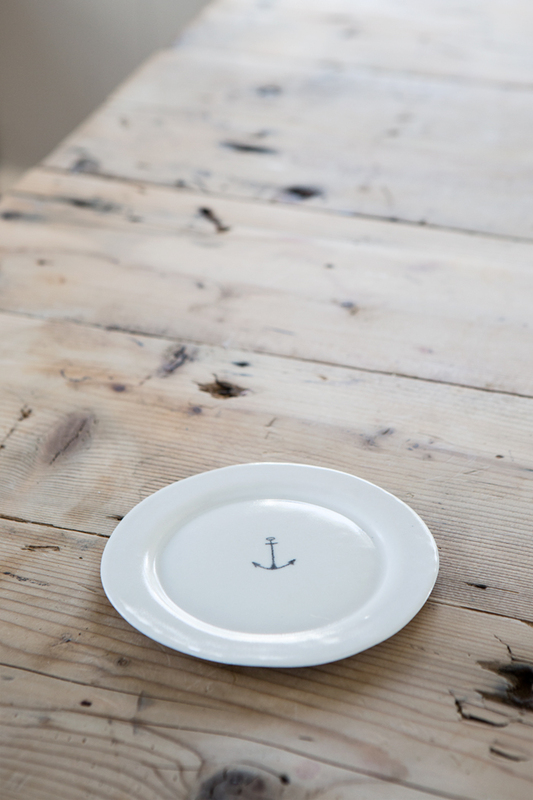 It is the dish named ‘Oh Sailor’ with a hand drawn anchor (pictured below). If you would like to win, simply leave a comment below. The giveaway will close on Sunday, April 27th. And please make sure to leave your name and contact email so I can get in touch with you. And you are welcome to join in regardless of where you live in the world! Inspirerande person och väldigt stilrena verk! Åh, så vackert. Alltsammans! Så vackra bilder. Och hantverket. Bilden på urnan i fönstret – fantastisk. Gillar verkligen din nya serie redan nu. Kul att få inspiration och nya bekantskaper. Fin påskhelg till dig. It’s so so beautiful! Thanks for the chance to win! Your pieces are GORGEOUS. 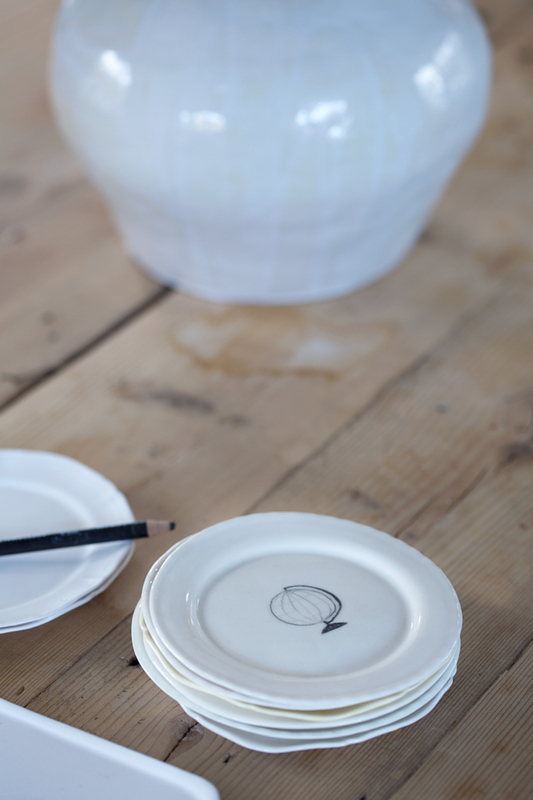 I would happily stock my entire kitchen with your ceramics! We just signed a 2 year contract to stay in Sweden, so we’ve just started stocking our house, it’d be an honour to start with your piece. Thanks for the chance! Tack för en jättefin blogg och inspirerande bilder på instagram. Jag gillar verkligen porslinet och det gör sig så bra i det rustika köket, precis som det skulle göra i mitt kök. Oavsett vinst eller inte så är det ett porslin jag skulle vilja köpa. Särskilt de små vackra skålarna. Vilket inspirerande reportage! Och man kan ju inte annat än bli hopplöst förälskad i sådan keramik. Unika, vackra vardagsföremål är svårslaget! Her pieces are wonderful, I’m so glad you introduced Elin to us. What a gorgeous and natural work, I’m truly delighted! That is, hands down, the most beautiful work of art I have seen in a long time! 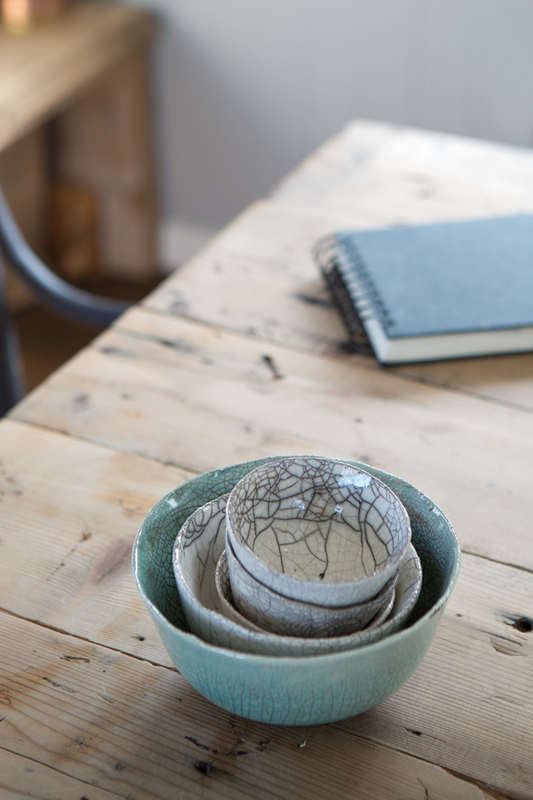 Lovely ceramics and space! 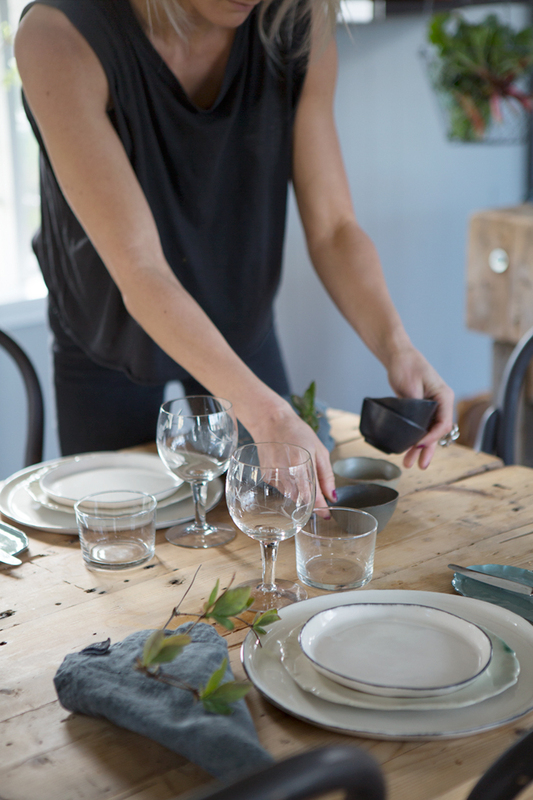 After working as a prop styling intern and trying to source some beautiful, handmade dishes (which wasn’t that easy), I have a new level of respect for ceramicists! Looking forward to reading more Creative Q & A’s! Very interesting Q&A. Her work is truly amazing! Vilken bra idé! Passar ju jätte bra ihop med dina fina matbilder. Oh,I would love to win that pretty dish! Vilka vackra bilder och så roligt att läsa sådana här intervjuer. Bra jobbat! Åh vad fint! Ser redan fram emot nästa Q&A. Vackra och inspirerande bilder som alltid. Ha en fortsatt fin dag! Hur fin keramik som helst och intressant reportage! Vi har precis sålt vår båt med alla mina barndomssommarminnen i. Min mamma gjorde porslinet till båten så jag vill gärna ha ett litet fat med ett ankare som souvenir. Vilket fantastiskt reportage om fantastisk keramik!! Skulle vilja ha alltihop men den underbara lilla tallriken skulle vara en bra början! Blev totalförälskad både i din blogg och Elin Lännsjös keramik! Så mycket inspration, känsla och genuinitet! Älskar det långsamma, när saker får ta tid, långt bort från massproduktion och köphets. Där sakerna i ens hem älskas och nöts och får vara med genom livet. Glad över att ha hittat till din sida! Very inspiring. The interview as well as Elin herself. Shows you how you can always turn your profession into something new almost by ‘mistake’ and start doing what you really love to do even if you never thought of doing that. To me this is the big point in life…turning your hobby into your profession and enjoy doing it every single day. And if you’re not that lucky just yet, just surround yourself with beautiful things that inspire you…photographs, interesting magazines and books, talking with inspirational people, spring flowers, creating a healthy and visually appealing meal and last, but not least, beautiful ceramics on your shelf are a source of great inspiration :). Thank you for this amazing blog as well as introducing to us such exceptional human beings that keep inspiring our daily lives and reminding us that dreams do come true. Vilket habegär! Porslinet är fantastiskt, blir nog en beställning till sommar huset. Tack för inspiration på morgonkvisten! Jag vill såklart gärna använda den fina ankartallriken. Elin’s work is truly beautiful – sophisticated and delicate but raw at the same time. I love this new series, Sonja! And what a great interview with Elin Lannsjö. Huge thanks for introducing us readers to her gorgeous work. So excited to see what inspiring artists you’ll feature in the future. So beautiful. Elegant and classic design. …Ohhh it’s so late, I hope I’m not too late! My voyage in blog’s Ocean started few weeks ago and my vessel “Vanilla&Staubzucker” need this gorgeous anchor! I am going to try to make this cake, we love the saffron flavor as I usually make saffron buns at Christmas.